I don't think you need any introuduction to Cake Pops. Everybody knows about it after it was seen in Bakerella. The moment her book Cake Pops was out I wanted to buy but then she herself had written that these cuties are really sweet, so that put me off buying the book. I still didn't buy it, but as you can see now I coudn't resist buying the book and making them. I made them today and when Shyama came home for lunch ( as she is going summer job for a month) she even had one as a dessert so Hans and I joined in. Ok they are indeed sweet even though I made my own cake and I lessed half the suagr which was given in the recipe. I did the exact amount of suagr when I made the frosting, but next time I will try to add less sugar to the frosting too. I am sure if you make then with the amount of sugar in the book they would be over sweet as Bakeralla make the cake from readymade cake mix. She has indeed give a recipe for home made cake and that is what I did but with lesser sugar. 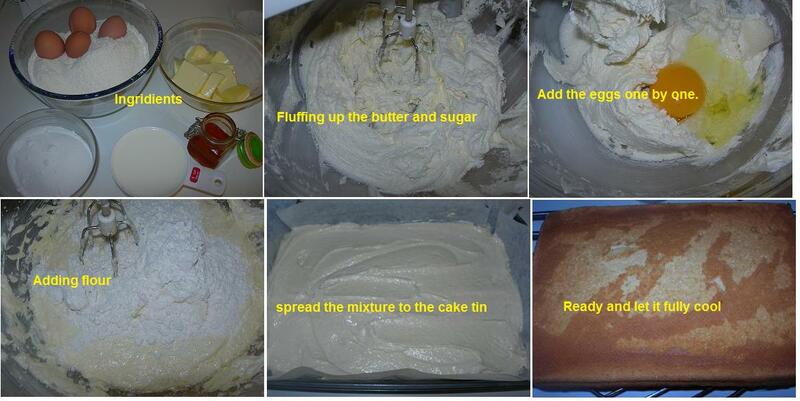 Bake the cake as directed on the box or make from scrach with the recipe below, using a 9 by 13 inch cake pan. 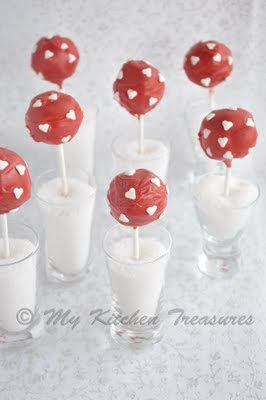 Once the cake is cooled, get organized and set aside plenty of time, to crumble, roll, and dip the cake pops. Add three quaters of the container of frosting or use the full home made frosting. ( you will not need the remaining frosting). Mix it into the crumble cake, using the back of a large metal spoon,until throughly combined. If you use the entire ready made container , the cake balls will be too moist. The mixture should be moist enought to roll into 1 1/2 inch balls and still hold a round shape. After rolling the cake balls by hans, place them on a wax paper ( i used silpat) -covered baing sheet. Cover with plastic wrap and chill for several hours in the refrigerator, or place in the freezer for 15 minutes. You want the balls to be firm by not frozen. Melt the candy coating, following the instructions on the package. MW on medium heat for 30 seconds at a time, stirring with a spoon in between. You can use a doubl boiler. Either way make sure you do not over heat the coating. Now you are ready to dip. 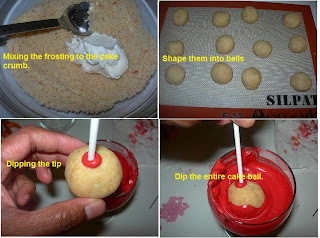 Take a few cake balls at a time out of the refrigerator or freezer to work with.. If they are in the freezer, transfer the rest of the balls to the fridge at this point, so they stay firm but do not freeze. One at a time, dip about 1/2 inch of the tip of the lolipop stick into the melted coating and then insert the lollipop stick straight into a cake ball, pushing it no more that half way through. Holding the lollipop stick with teh cake ball attached, dip the entire cake ball ino the melted candy coating untill it is completley covered, and remove it in one motion. Make sure the coating meets at the base of the lollipo stick. This hels to secure the cake ball into the stick when the coating sets. The thinner the consistency of your coating the easier it will be to coat the cake pops. If you find the coating too thick, add some shortening or paramount crystals or oil to thin the coating. Stick the cake into the styrofoam block. Repeat the remaing cake balls in the same method. Preheat the oven to 350° F. Grease and flour a 9 by -13 inch cake pan. In a large bowl, whsik together the flour, baking powder and salt. Set aside. Crea the butter and sugar with a mixer for 5 minutes, untill light and fluffy. Add the eggs one at a time, to creamed sugar and butter, mixign untill just combined. Scrape down the sides of the bowl after each addition. Add the vanilla and mix untill combined. Spread the batter ( it will be thick) evenly into prpared pan. Bake for 35 to 40 minutes ( in my oven it was fully baked after 28 minutes) or untill a toothprick inserted in the center comes out clean. Let the cake cool completley before crumbling for cake balls. Cream the butter and vanilla with a mixer untill combined. Add the sugar to the creamed mixture in two or three batched, scraping down thesides of the bowl after each addition. If needed add the milk to make the frosting creamier. Tips she had mentioned in her book. I would personally suggest, if you are serious about making pops more than once, you should buy the book as she has given in details lots of good tips and I am too lazy to write down everything which she has mentioned in her book, but I am writting down few. Make the cake day before and let it cool overnight . If you are using ready made mix cake then it is easy to crumble by hand. But if you are using the cake from scratch use a food processor to crumble the cake. SHe also have given this tip which i used, she had written as 4 dozen pops are too many??? You can make as few as a dozen that is what I did. You make the cake and cut into 4 quaters and use 1 quater for 12 pops and freeze the rest of the cake for another time. Just make sue to adjust the amount of the butter cream. I do have step by step pictures, I will add them when I download the pictures. Those pops are so pretty! I have never made any pop before...must give them a try. Pretty pops...waiting for the recipes now.. So cute they are Finla! totally agree with Hans! These look so cute. Where did you stick it in ? They look wonderful and cute. I have never tried making them at home. Waiting to know the recipe. Awww. cuteness. I like the color combination, too and it looks appetizing! Those cake pops looks damn cute and soo elegant..fantastic,they came out super prefect..
Bongmom I used glass filled with the sand we get in bottles which we use for candles. They are so cute, you have got lots of patience. thats amazin finla.... and ur pix Masha Allah... awesome...so perfect!! Rakh's try them they are not that difficult to make, just it takes time. Those look so nice and mouthwatering! 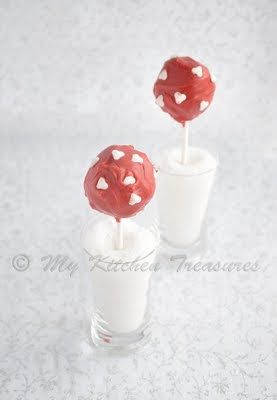 I have yet to make cake pops. Yours are adorable! those pops are sooo cute!! Well, Finla, I left all my comments on Facebook, but just to say two things: your cake pops are so pretty (I love all the girly things you make) and that I am so glad you did both the cake and icing from scratch. So many use boxed when making these. Yours sound just delicious! And I wished I could have watched Hans eat some. Cute! The cake pops look so cute and you did a great job. Wow, irresistible cake pops..looks so cute and delicious!